I’ve been asked a couple of times about the Taurine that I ride on some of the race pictures. We are working on a new graphical layout for the blog, but until that is done, here are a couple of more images to clarify about the Taurine. Sorry for the poor image quality. It’s a 2008 model, size medium. I prefer medium with my 182 cm but I’m kind of in between sizes. The setup is team replica with some small tweaks. 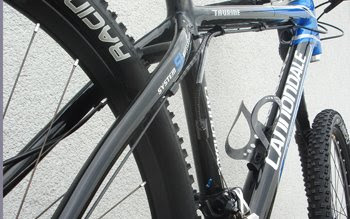 One of the best features of the bike is the 88-tuned carbon lefty which ways only 1220 grams for 110 mm super smooth travel. 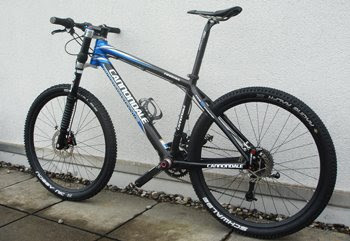 The fork is the stiffest xc-fork you can find and it just works fantastic. 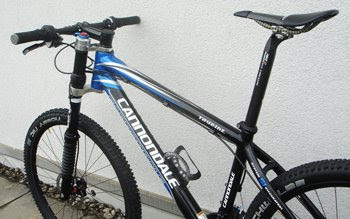 Drive train is SRAM X.0, Cannondale BB30 crank set and Shimano XTR in a nice mix. I use Nokons to connect shifters and detailers and I have gold and blue colored cable details for a nice finishing touch. Saddle is Tune Speedneedle which is really comfortable but still super light. I have a Ritchey seat post to allow some set back and I have a 120 mm stem with a 5 degree negative angle. Wheels are made of DT Swiss 240 hubs upgraded with ceramic bearings, rims are Stans Olympic weighing 247 grams as you can see being written on the rim. 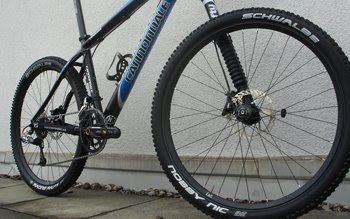 The wheels are laced with 32 Sapim Lazer spokes. Momentarily I run tubeless in the back and latex tube in front; tires are supplied from Schwalbe and a classical RR/NN setup. There are some more images to be found in this old post, thanks for your interest in the bike. I’ll try to get the Scalpel done as soon as possible and upload some more images. Hvilken dunkholder er det du bruger? Dunkholderen er fra USE og fungerer rigtigt godt. 19 gram let og den griber rigtigt godt om flasken. Hvilken skønhed. Den er rigtigt flot i blå!